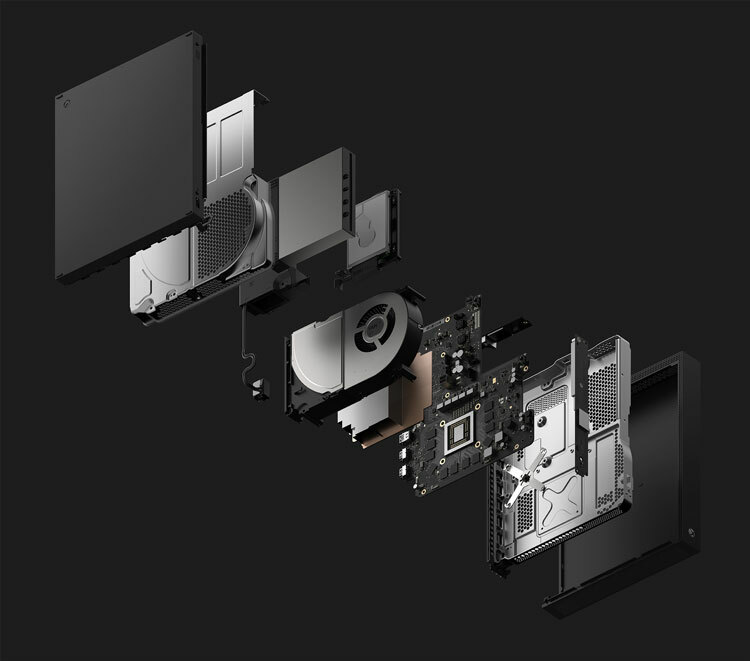 While Sony went with brightening up its PlayStation 4 this week, Microsoft has used the 2017 E3 conference to announce a powered-up version of its Xbox console – the Xbox One X.
There’s no bling or radically altered exterior. Yes, it’s a little more svelte, but the big story with the Xbox One X is in its specs. Its Scorpio Engine runs so fast, and so hot, it requires liquid cooling, along with a supercharger-style centrifugal fan. All of this throws 4K images to the screen for newer games, via the UHD Blu-ray Optical Disc Drive. For older games, the Xbox One X will upscale images to 4K UHD. Ports include 2 x HDMI (1 HDMI 1.4b in,1 HDMI 2.0b out), 3 x USB 3.0, IR Out, S/PDIF, and ethernet. Microsoft’s Xbox One X has a worldwide release date of 7 November 2017. Its Australian RRP will be $649. The Xbox One X will ship with a 1TB hard drive, and also in the box will be an Xbox Wireless Controller, HDMI cable, 1-month free Xbox Game Pass subscription, and a 14-day free Xbox Live Gold membership. Previous ArticleA more bling PlayStation 4? It’s coming, in two limited edition colours.